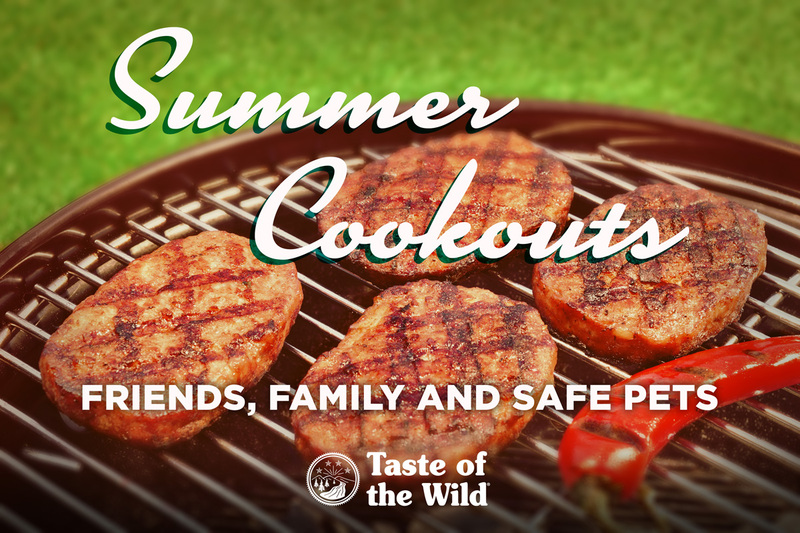 Summertime means plenty of outdoor activities, including grilling, barbecuing and eating. Many pets love spending time outside too, and it’s only natural that we include them in our summer festivities. But have you ever considered the risks to your pet when you’re grilling outside? Before you fire up the grill — and to keep your top dog from becoming a hot dog at your next cookout — here are five tips for keeping your pet safe. Cookouts and barbecues are all about food and fun. If your four-legged family members could talk, they most likely would agree. However, it’s important to keep dogs and cats on their normal diets. While one or two bites of cooked chicken, steak, hamburger or hot dog is unlikely to cause health problems, an entire meal of greasy, fatty or spicy foods may trigger stomach upset, diarrhea and even pancreatitis (inflammation of the pancreas). Other foods — grapes, onions, garlic, raisins and chocolate — can result in serious health problems for dogs and cats. So if you’re entertaining, ask guests to not slip table scraps to your pets. Instead, have pet-friendly treats available for guests to “sneak” to a begging buddy. As for cooked bones, make sure they go into a secure trash can and not your dog’s mouth. Cooked bones, which splinter easily, are a choking hazard, and chewing on them may lead to broken teeth, mouth injuries or intestinal perforation or blockage. Pets often find the aroma of grilling meat irresistible, and flames and hot coals make this a dangerous desire. If your cat or dog jumps onto a hot grill, they could be seriously burned, or they could knock over the grill, causing a fire. The best way to avoid grill-related accidents is to keep your pets indoors, secured in an area of the yard away from the grill, or distracted from the grill area by playing with friends and family. Be sure to use a drip pan with your grill. If meat juices reach the ground, your pet may eat them — and whatever the drippings cover such as stones, mulch and sticks. Hot drippings can burn a pet’s mouth and throat, and they may also trigger stomach upset. Keep matches, lighter fluid and the grill-cleaning brush out of your dog’s reach. According to Pet Poison Helpline, matches contain chemicals capable of causing vomiting, bloody diarrhea, tremors, kidney failure, breathing problems and liver damage. Lighter fluid and tiki-torch fuel are irritating to skin and, if consumed, may cause stomach upset and breathing and nervous system problems. Metal bristles from a grill-cleaning brush can break off and lodge in your dog or cat’s throat, stomach or intestines. If your pet ingests items such as stones, matches, lighter fluid or charcoal, you should contact your veterinarian or an emergency veterinary hospital. You also can call Pet Poison Helpline (800-213-6680) or ASPCA Animal Poison Control Center (888-426-4435) for advice. Plates and bowls of uneaten food can prove irresistible to pets. To keep table-surfing dogs and cats from eating leftovers, the foil or plastic used to wrap meat, or shish kabob skewers, clean up quickly. All trash should go into a covered garbage can to reduce pet scavenging. Should your pet access the garbage, they may develop vomiting, diarrhea, pancreatitis or an intestinal blockage. Heat stress and heatstroke are medical emergencies, so if you see any of these signs, contact your veterinarian or emergency veterinary clinic immediately. While accidents may still happen, following these safety tips can help your four-legged furry friends stay safe while enjoying cookouts this summer.